CAMI Research Inc. (Acton, MA) has released a High-Voltage (HV)-rated QuickMount housing (CBH2) for its CableEye automation-ready, cable and wire harness testing systems. As a free-standing, quick-release board fixture, it allows users to connect CAMI’s test interface boards to the 64-pin headers of any expansion module - even at some distance. The housing may be used with any CableEye model and is rated to 2100 Vdc / 1500 Vac. 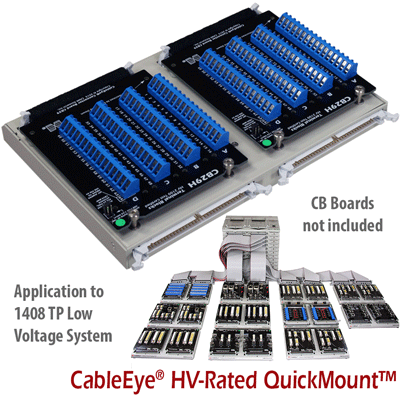 A leader in development of PC-based cable and wire harness, continuity, resistance and hipot test systems for over 20 years, CAMI offers the CableEye suite of products complete with accessories – including plug-in connector boards. The selection of these test fixture boards is constantly growing and is currently numbering over 60 – most of which are populated with families of connectors. When pre-populated boards are used, the tester GUI automatically displays a graphic of the connectors under test. This free-standing board-fixture supports any CAMI connector board. Use this for connecting these boards to an expansion module, or for applications in which the connector boards must be separated from the tester. If desired, boards may be locked in place using supplied nylon thumbscrews. Choose a length of expansion cable to extend the housing away from the tester by the desired amount. For systems larger than 256 test points, use multiple QuickMount housings with increasingly longer expansion cables as shown in the photo (we will build to order). There are two types of expansion cable. For test voltages up to 500 V, we have ribbon cables (Item 856). For higher test voltages we offer optional Ampmodu cables (Item 864). QuickMount housings are included in CableEye’s standard, renewable one-year warranty of the tester for which they are purchased. Available immediately, the CBH2 is $250 (Item 712H) and requires two expansion cables (Item 856 or Item 864 as appropriate for the test voltage and connection length) to connect to the tester: Two 5” ribbon expansion cables are included. An optional add-on tilt stand (Item 712A) may be purchased for each housing. Connector boards are not included.